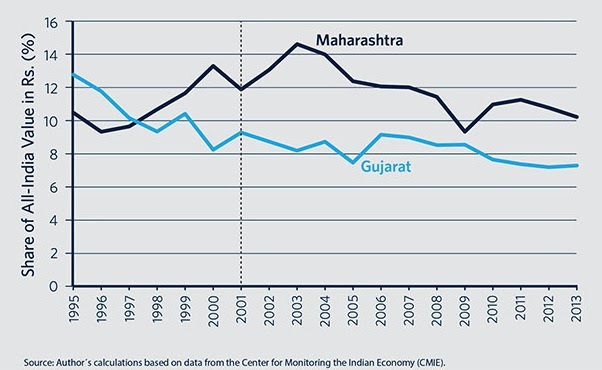 A top expert with the Carnegie Endowment for International Peace, a foreign-policy think tank with centres in Washington DC, Moscow, Beirut, Beijing and Brussels, has strongly disputed those who tout Gujarat’s growth over the last decade as exemplary, saying whether it is foreign direct investment, overall investment in the economy, or governance, the state has been an average performer. Milan Vaishnav, associate, South Asia Programme, and previously with the Columbia University with primary research focus on the political economy of India, neither was there what the Gujarat chief minister called “pro-people good governance” nor “minimal government, maximum governance,” as he claimed before India’s largest business houses. Beyond foreign investment, Vaishnav says, the picture is also not that clear-cut for all investment projects, regardless of investor class. “Gujarat’s share of investment projects (in value terms) during Modi’s decadelong tenure has hovered just above 8 percent, which is impressive given that Gujarat accounts for less than 5 percent of India’s population but is roughly on par with Gujarat’s share of the overall economy”, he points out. 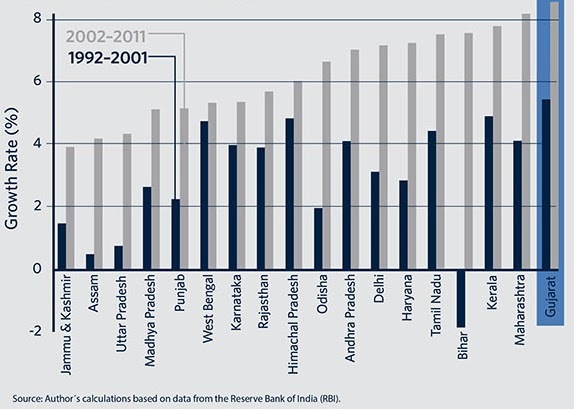 In fact, the expert says, “the share of investment projects under implementation in Gujarat between 2001 and 2011 almost perfectly mirrors the all-India trend; there is no clear indication that Gujarat deviated sharply from India as a whole. There has also been a large gap between lavish project announcements made at Modi’s biannual investor gathering, Vibrant Gujarat, and the projects that materialize. Indeed, when it comes to tallying projects that actually break ground, Gujarat is outshined by its neighbor to the south, Maharashtra”. As for social development, the expert looks at two of the most widely cited indicators of social development: literacy and infant mortality. 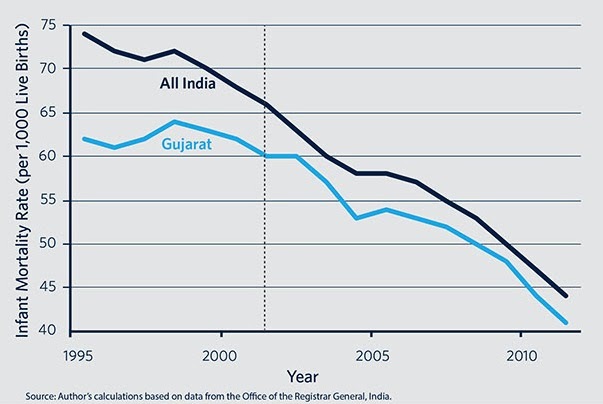 “In 1991, Gujarat’s literacy rate stood at roughly 61 percent, 9 percentage points above the all-India average. 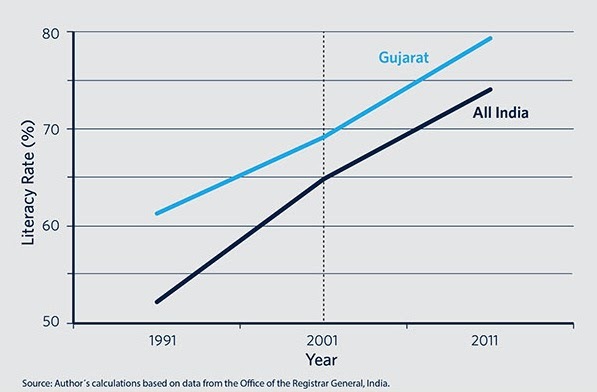 By 2001—the year Modi came to power—the gap between Gujarat’s literacy rate and the national average had narrowed by half. With Modi at the helm, the literacy rate improved another 10 percentage points over the next decade, increasing the pace of its gains in line with the all-India trend”, he says. Pointing towards the need to analyse Gujarat’s “progress” on social development from the angle another angle , the expert believes, it should be seen “more directly measuring how well it has maximized the social development bang for the growth buck—in others words, looking at how a 1 percent gain in per capita income has affected literacy and mortality.” This, he suggests, would show how the state’s rulers have governed the state. 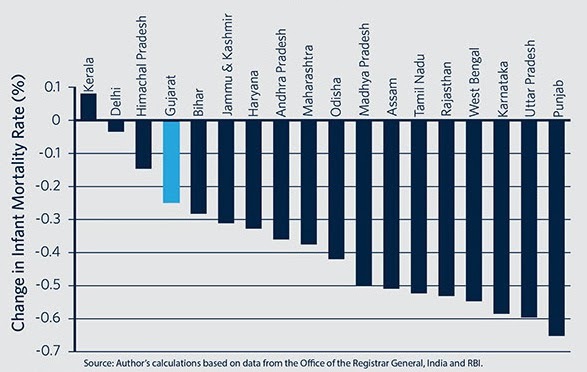 “Here, the relative shortcomings of the Gujarat model are more readily apparent: the state is situated toward the bottom of the pack when it comes to harnessing greater wealth for improved social welfare (see figures respective). Relative to how much growth it has enjoyed, Gujarat’s social development performance has not been particularly noteworthy”, he says.